Portraits of a Predator from BlueBlood on Vimeo. Take three minutes and experience the world of Salvenus confluentus. 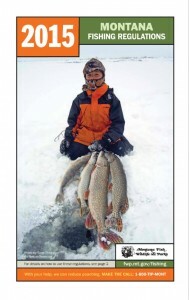 The 2015 Montana State fishing regulations are now available at the FWP website. You can download or print PDFs covering everything from the full regulations to district-specific information here. Here’s a quick “Montana Minute” type video of a little dry fly action on the Madison from the guys at Blue Ribbon Flies. After hosting our magazine on ISSUU for over three years, I have decided to move all our issues to Yumpu. This move will be complete by March 15. This video by Creekside Media takes a look at the art and creative philosophy of Stripn Flywear Creator Dave Hartman. FIRST LIGHT from Creekside Media on Vimeo.